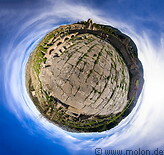 Djemila, a small city in the Atlas mountains of northern Algeria, is the site of the ancient Roman city of Cuicul. Cuicul originated in the 1st century AD as a Roman military garrison in the mountains of the northern African province of Numidia at 930m of altitude, on a plateau between two rivers. The location of Djemila is very scenic, because the site is on a meadow surrounded by the mountains. The entrance to the archaeological site is at the northern end of the village of Djemila. Next to the entrance there is a small museum with some artifacts. A small path leads to the ruins, which are spread to the left and the right of the main street, the Cardo Maximus. Roughly in the middle of the site there is the temple of Septimius Severus. From here a side road leads a theatre. 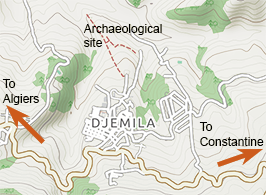 Djemila has been a UNESCO world heritage site since 1982. Djemila is 311 km to the east of Algiers. Most of the road is motorway, but the last 25km are a narrow and winding mountain road. With a (lunch) stop it takes five hours to reach Djemila from Algiers. Google Maps shows some hotels in Djemila, but it probably makes more sense to spend the night in Setif, where there is more choice of hotels.